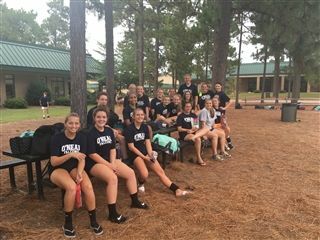 The Lady Falcon's ended the week on a positive note playing conference foe Cary Christian to a tie loss (23-25, 22-25) on Thursday night. Behind the strong serving from 8th grader Holly Pashley, and defensive work from 10th grader Juliana Grimm the Lady Falcon's hung tough on Thursday night. 9th grader, Natalie William's lead the team in kills, while 8th grader, Maddie Dishman had numerous assists to go along with her strong defenisve play. Overall, the Falcon's continue to grow and improve this season, and look forward to a tough rematch on Monday against conference opponent St. David. The game is set to start at 4pm in the Hannah Center Gym.